The Coalition for Clean and Fair Elections (BERSIH2.0) strongly condemns the Prime Minister, Election Commission (EC), and Members of Parliament who supported the motion for passing and gazetting the redelineation proposal in haste last week. BERSIH2.0 maintains that the tabling, passing, and gazetting of the redelineation proposal was procedurally illegal as the EC has yet to complete the second local inquiries in Selangor. This issue is presently being challenge in the Shah Alam Court by 107 plaintiffs representing a group of over 10,000 voters. In conducting a redelineation exercise under Article 113(2) of the Federal Constitution, the EC is constitutionally obligated to reduce malapportionment and ensure that the number of voters in constituencies are “approximately equal” as per required under Section 2(c), Thirteenth Schedule of the Federal Constitution. The EC has also worsened malapportionment by creating super-sized constituencies. After the redelineation, the top ten largest Parliamentary Constituencies have sizes ranging from 108,156 voters to 150,439 voters, much larger than their state average (refer Appendix 2). These constituencies are created by packing in predominantly opposition voters into already large constituencies. The end-result of malapportionment is not only the violation of the “one person, one vote” principle across constituencies, but may also be a complete subversion of democracy by crowning the loser if malapportionment is correlated with electoral strength. And when the voters’ mandate for the Parliament and government is insidiously distorted, the legitimacy of the entire political system is called into question, undermining political and economic stability. In the 13th General Elections in 2013, the Barisan Nasional (BN) coalition only won 47% of the popular vote, but that translated into 60% of parliamentary constituencies, exactly because not only parliamentary constituencies are malapportioned, but constituencies won by BN were markedly smaller than those won by the opposition coalition, Pakatan Rakyat. Based on the electorate figures used in the delineation exercises in the States of Malaya, Sabah and Sarawak, those constituencies won by BN in 2013 would have only 48,228 voters in average while those won by the opposition would have nearly double the number, at 79,436. This means BN may be returned to power again if it loses majority votes. BERSIH2.0 has also detected attempts to sway electoral results in marginal seats by transferring polling districts between constituencies based on voting pattern. Similar gerrymandering, especially packing of opposition supporters into super-sized constituencies, were also discovered in several other states such as Perak, Selangor, and Johor. Preliminary analysis shows that these would have a material effect on several marginal parliamentary constituencies across the country. In an interview with the New Straits Time on 29 March 2018, the EC chairman Tan Sri Mohd Hashim Abdullah stated that ethnicity was one of the criteria considered during the redelineation. BERSIH2.0 condemns and rejects the institutionalization of race and ethnicity in our electoral system at the expense of local ties. Such action by the EC and Tan Sri Hashim disregarding the conditions for redelineation in the Federal Constitution is illegal, discriminatory, and morally wrong. The EC states that the redelineation was done based on demographic and population changes over time due to development, but it failed to propose any changes, either excluding them from the 1st Recommendations or having all changes reversed by the final recommendations, for the states of Perlis, Pulau Pinang (for both State and Parliamentary Constituencies) and Pahang (for Parliamentary Constituencies). The exclusion of Pulau Pinang and Pahang are clearly unjustified from the standpoint of “approximately equal apportionment”. In its final report, the EC stated that the number of voters in Pulau Pinang has increased by 31.6%, i.e. from 659,155 voters since the last redelineation in 2003 to 867,748 voters in 2015. Likewise, number of voters in Pahang has increased by 33.5%, i.e. from 554,321 voters in 2003 to 740,023 in 2015. Keeping the same boundary hence sustains the severe malapportionment of parliamentary constituencies in Pahang and state constituencies in Pulau Pinang, with the largest-to-smallest constituency ratio at 2.93 times and 1.68 times respectively. In effect, voters in these states are deprived of the right to have their constituencies redelineated for better representation and local ties. As there must be a gap of at least 8 years for the next redelineation to happen, voters in Pulau Pinang and Pahang are effectively forced to use old constituency maps (based on 2003 redelineation) for 23 years because of the failure and incompetence of the EC. 10 parliamentary constituencies in Selangor, Kuala Lumpur and Kedah adopted the 1st Recommendations ditched after the 1st round of Inquiry. This means the EC had agreed with the objectors that their 1st Recommendations were ill-planned yet the same body soon readopted the recommendations. Most shockingly, the u-turn was not even based on any solid objections. (refer Appendix 7). As for Sabah, the Sabah State Assembly has amended its State Constitution in 2016 to add 13 new State Constituencies. The redelineation report was completed and handed over to the Prime Minister on 21 February 2017, but he has chosen not to table the Sabah redelineation report in the Parliament without any justification. While the Second Recommendations for Sabah were badly malapportioned, raising concerns the final recommendations may worsen the malapportionment of both parliamentary and state constituencies, the Prime Minister simply has no right to delay the tabling. This is also a waste of public resources as the EC has conducted two rounds of public display, local inquiries and preparing the final report. BERSIH2.0 therefore reiterates its rejection of the whole redelineation process and the final report that was tabled and passed in Parliament. The Election Commission has not only disregarded due process and constitutional procedures. It has also proposed recommendations that violate key principles required by the constitution. It is clear that the Prime Minister, Parliament, Election Commission, Judiciary, and police were all complicit in rushing and ensuring that the redelineation was passed at all cost, in order to influence and steal the upcoming general elections. 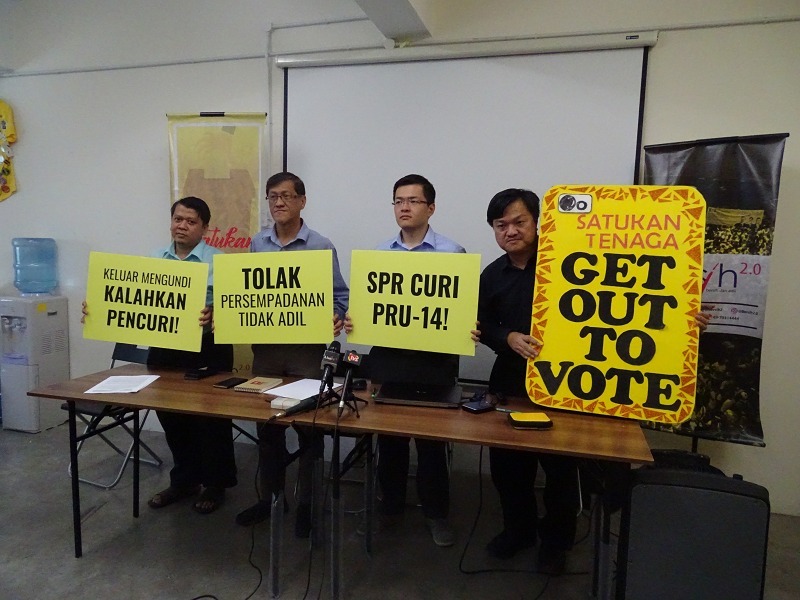 BERSIH2.0 urges all voters to reject electoral manipulation by ensuring that they vote in the upcoming general elections. While we may not be able to stop redelineation from being passed, a high voter turnout will be able to reduce the impact of the electoral fraud and manipulation. Satukan Tenaga – Keluar Mengundi, Kalahkan Pencuri!